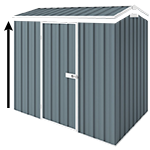 This model has a 0.849 cubic metre capacity and comes in Light taupe colour. It is great for storing garden accessories and bins. The 2-door front panel comes with padlock hasp and ramp; and the lid can also be lifted up with a holding rod. This model can also accommodate wood shelf.